YEREVAN (Azatutyun.am)—A leader of the Armenian Revolutionary Federation, Armen Rustamyan, accused Prime Minister Nikol Pashinyan on Monday of abusing administrative resources and trying to stifle dissent ahead of Sunday’s parliamentary elections. Rustamyam condemned Pashinyan for telling the National Security Service (NSS) to “deal with” politicians accusing him of jeopardizing Armenia’s and Nagorno-Karabakh’s security. Pashinyan decried over the weekend “false” opposition claims about a government “conspiracy against Karabakh” and a suspension of Russian arms supplies to Armenia. They may amount to high treason, he declared without naming names. Rustamyam suggested that the premier referred to Dashnaktsutyun as well. “If he didn’t mean us, I would ask him to elaborate on his statement,” he said, adding that the authorities must stop trying to “find traitors” in any case. “These unaddressed accusations are creating an atmosphere of terror and a situation where we can already speak of unequal conditions and abuse of administrative resources,” he told reporters. 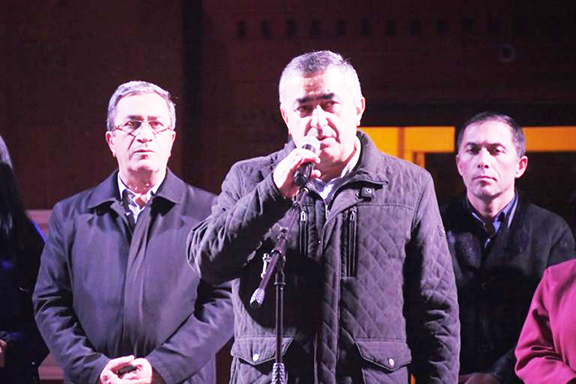 Rustamyam went as far as to draw parallels between Pashinyan and former President Levon Ter-Petrosian, who banned the ARF and had some of its leaders arrested in 1994-1995. Another ARF leader, Hrant Markarian, is among those critics of the new Armenian government who have claimed that Russian arms deliveries to Armenia stopped after Pashinyan came to power in May. The premier angrily denied Markarian’s claim at the start of his election campaign last week. The picture is taken in City of Armavir and not Yerevan during an election rally in that city. ARF is organizing similar rallies in different city and I am surprised that Asbarez is not reporting about them in details and widely. ARF is doing a lot on the ground for this elections, especially its youth, but unfortunately there are no mention of their activities in Asbarez. That is sad. I don’t understand what Rustamyan and Markarian are trying to do other than creating problems? Don’t they have anything else to do? Can please something tell them to stop bickering and concentrate on your platform, whatever it is? For sake of our homeland stop polarizing and start getting united, enough is enough. I think ARF is struggling to establish credibility. Why all these accusations now? Why didn’t they criticize the previous presidents? For the last 20 years ARF bureau was a part of Serj Sarkisyan’s and Robert Kocharyan’s corrupt government.